Let’s start with the amount of followers we had on May 1st and how that changed during the month. The raw growth for the month equaled 2,446 and the percentage growth increased by 43%, which is the percentage highlighted in the title of the post. This is a fairly large increase, so let’s put some context behind this. While I joined Twitter back in 2008, my effort on that site has ebbed and flowed over the years. Sure, I participated but most of my social media attention has been focused on LinkedIn, as I co-wrote one of the first books on that topic back in 2008. I then wrote a completely revamped second edition of that book in 2013. Earlier this year, this changed. I thought about the various social presences I’ve built and decided to put more time, attention and resources into Twitter. Thus the additional attention is the primary reason for a 43% increase. What does this 43% increase offer in terms of benefits? My focus at this point is on increasing my relationship building with my target audience. As my following has grown, so has my interaction with them. 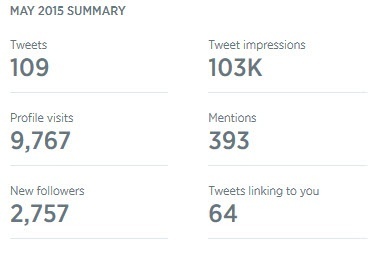 Therefore the main benefits I’ve seen over the last couple of months are (in no particular order) – more interactions, more retweets, more views to my content, more leads and more impressions to my Tweets. 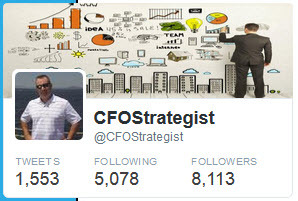 Ok, so the growth in the followers was strong but what happened inside of this month which contributed to this growth? My activity for the month in terms of Tweets decreased by 57 or 34% percent. On the surface, this doesn’t really offer much insight, so let’s dig deeper at the underlying elements. The average amount of impressions per Tweet was 945 (103,000 impressions / 109 tweets). In the prior month, it was 699 (116,000 / 166). That is something that caught my attention. My first thought was to wonder if there were a couple of tweets that received a huge amount of impressions during the month that didn’t occur in the previous month. It received 5617 impressions, which generated 71 interactions. 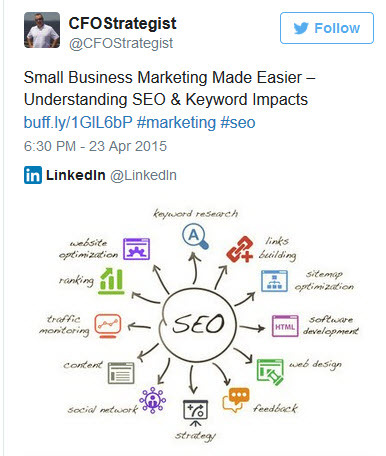 In April, the highest was this one below, which generated 23,797 and 33 interactions. Thus, it appears May’s data was comprised of activity that was fairly consistent, while April’s held a significant amount of variation. The second thing I noted but can’t really opine on yet is to determine what should be our target for the ratio of average impressions per tweet. My guess would be as one’s following increases, relationships increase leading to more retweets and visibility to one's tweets. My average ratio for April was 699 (avg. impressions) / 5667 followers or a rate of 12%. In May, it was 945/8113 or 11%. Using these stats, it would suggest my performance was down in May but given the huge fluctuations we saw in April, I’m not sure that is a meaningful data point. In addition, while getting more impressions is probably the goal, I don’t know if the rate we are seeing at 12% or 11% is good, bad or indifferent. The one data point I can add to this comes from a blog post by Kevan Lee over at Buffer where he shared their Twitter stats. He indicated an average impression of 12,769 and if you divide that by their total followers, this would create a ratio of 4%. Without any more data, there really are not any statistically relevant insights to be gleaned. But, I’ll close with this… this is something I am going to be keeping an eye on. 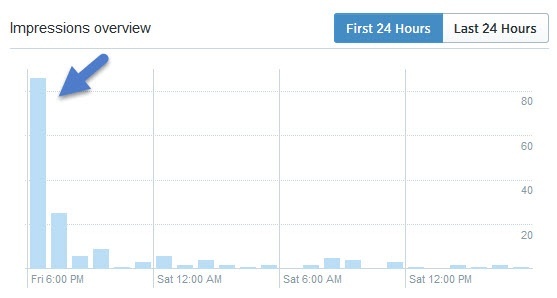 BUT… if someone with a big following retweets your tweet, you will see another spike or series of spikes in the amount of impressions you are receiving (see all the spikes with the red arrows). So, clearly engaging and relationship building with Twitter “influencers” can provide a tangible benefit, even if it is only a boost in the amount of impressions you receive. On the topic of engagement, this is certainly something of interest. If someone performs an “action” like retweet, clicked on the tweet to read more, favorited, clicked on your profile link, etc., that is counted as engagement. The highest engagement I received was 9.2%. On average, my engagement for the month was 1.7%. I was curious about this. Hubspot’s analytics report noted this was better than 66% of their customers. I also compared this again with Kevan Lee’s article. Their engagement rate was 2.1%, so at least we were in the ballpark. The goal we have is to build an audience of marketers, entrepreneurs and small business owners, as those are the ones that are most interested in what we do. Based on the Twitter graphic below, we appear to be reaching them, although we could probably continue to increase this around our target audience. So, how did we engage them to relationship build? During May, we retweeted, favorited and responded to people that were talking to us on Twitter. Going forward, we expect to more proactive in reaching out to our Twitter following. 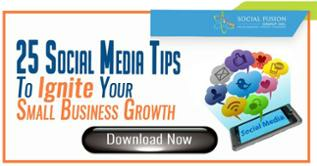 The ultimate goal is to build an engaged following to talk with / interact with on the topic of digital business growth. This is our behind-the-scenes look at Twitter for the month of May. There is certainly a lot more to dig into, but we’ll do that in part two of this series. 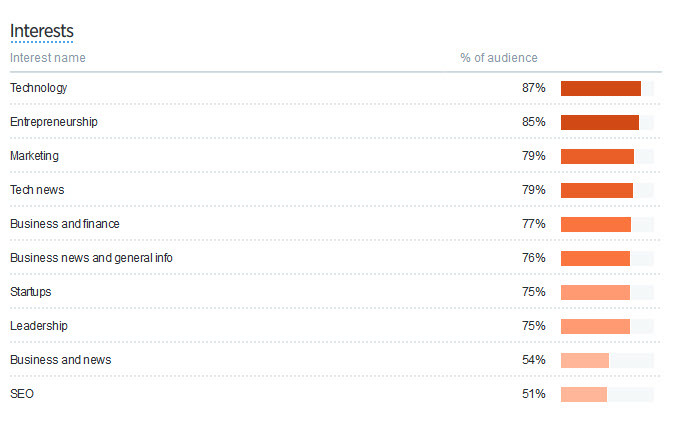 For now, thanks for letting us share, and please feel free to highlight your Twitter insights too!